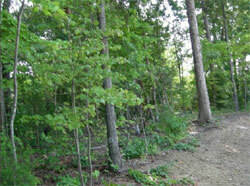 The forested area is primarily deciduous foliage with pine and cypress spread throughout. We enjoy the prospect of having some naturalized area and the benefits that come with it. But it did present some challenges for us. I never knew that what surrounds your home affects the kinds of plants and landscape that will thrive. I always thought it was just the soil, water level, and amount of sun light. Boy, it was a real lesson. If you own a plat of land that does not have any restrictions for excavation, then you may want to do the excavating procedures yourself to save money. These days, it is more practical to do things on your own rather than hire someone else to finish the task for you. Instead of purchasing expensive building materials, you might only need a chainsaw, brush trimmers, branch cutters, a rake, and a pair of work gloves to avoid cuts and scratches. Wear protective gear as much as possible, so you can be protected from thorns and rocks. Always keep an eye out for poisonous plants such as poison ivy. Also, when setting up supports to hold your posts up, make sure that you level out a space for every pier and remove all small trees before you begin framing. Make sure that the surface of the ground is hard and smooth. There should not be any mushy spots around. When your plat of land is vast and cannot be taken care of with simple materials, you may need to acquire a tractor. There are different types of tractors for different purposes. You should get one that is capable of excavating trees, clearing land, and leveling areas for numerous construction projects. Make sure that you know which attachment to use with your tractor, so you will not have a hard time completing the task. To start excavating your plat of land, you should attach the blade of the bulldozer to the front of the tractor. This procedure has to be done in order to eliminate any brush, trees, and debris. Then, you should scrape the land thoroughly and push the debris aside into a pile. You need to replace the blade of the bulldozer with the bucket to pick up and dump the brush, trees, and debris into a disposal unit, usually a dump truck. Remember that buckets come in a variety of sizes. They are designed to hold different capacities; so see to it that you choose a size that can efficiently reduce the load you have to move. Afterwards, you need to dig any small trenches or pits with digging teeth. For major excavation procedures, you need a backhoe attachment that can dig deep holes as well as loosen the ground effectively. Next, you have to place the blade of the bulldozer back to the front grade and level the plat of land. Leveling piles of excavated soil is necessary so they do not collapse as you do the job. You have to use front-end guards, belly pans, and special tires that are resistant to thorns. There should also be engine side guards, so the tractor is protected when clearing brush that contains many thorns. You should also scoop dirt onto the screen so you can get the rocks that the bucket missed. Use a shovel to scoop adequate quantities of dirt, and then begin by focusing on one corner of the plat of land. Work your way around the entire area in rows that are one foot wide. While working, see to it that you empty the wheelbarrow and the screen whenever necessary. In case there are large rocks that the bucket missed, you should work around them with a shovel or a pick. You will need to lift them out by hand and use a wheelbarrow to put them away easily. Again, make sure that you wear protective gloves to prevent yourself from getting hurt. Be extra careful and remember to lift by bending at your knees and not with your back. Lifting the rocks with your back could be unhealthy. These are the basic steps of excavating and clearing your land. Once you have completed the clearing you will be ready for the next step in your home building process.